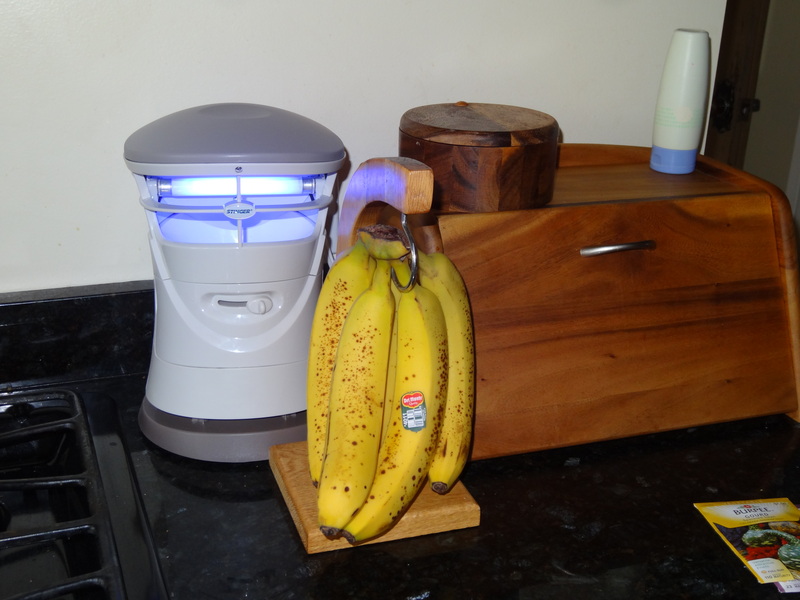 See this contraption with the glowing light behind the bananas? Of course you do. It’s an indoor bug zapper and in a household where there is always a container with scrap food for the chickens, a compost collection bucket, bushels of bananas and other various produce on the counter along with children who just can’t figure out how to close doors and dogs that know how to open them it is a most welcome eye sore to my counter top. Just for the fruit flies alone it’s been worth the $25 investment and as long as everyone rinses their dishes before placing them in the sink to await their turn in the dishwasher it works very well. See those bananas that are getting pretty spotty? How can ya miss ’em? I threw a few of them in a bowl with a left over sweet potato, added some other good stuff and voila! 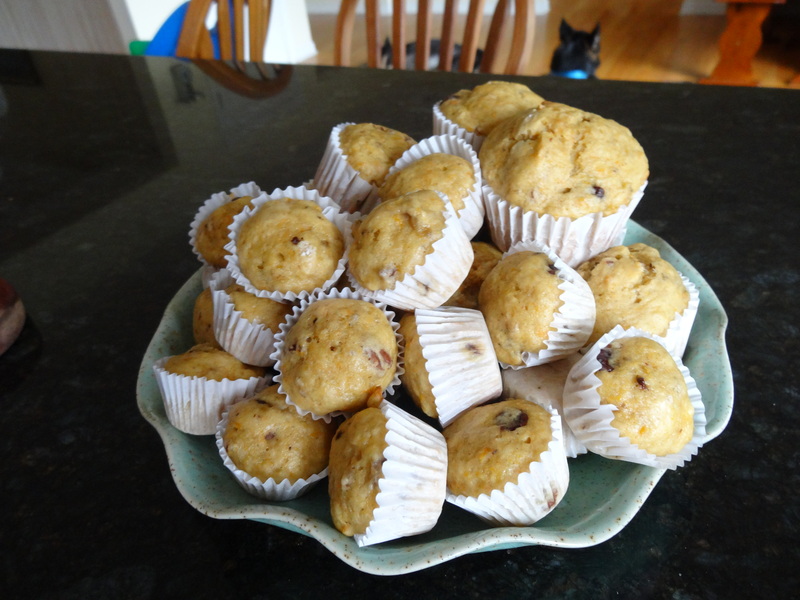 Out of the oven came some delicious muffins that are kid endorsed and mom approved. Here’s the recipe if you wanna give them a go. 5 out of 6 kids under the age of 7 loved them. My little girl was the snob of the group who would have preferred it if I simply gave her the sweet potato and banana in it’s true form not to mention she doesn’t really like chocolate chips. Little weirdo. 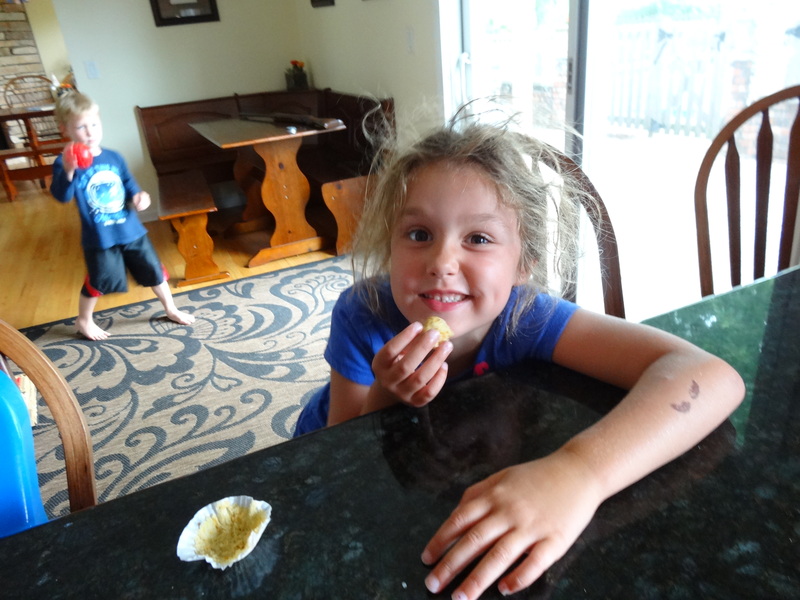 This is her “These are delicious! I need a big one now!” look. Don’t get me started on her hair!!! 1. Preheat oven to 350 degrees. Line muffin tins and spray with cooking spry (they stick to the liners a little if you don’t) or just spray the tins well without liners. 2.Combine bananas, sweet potato, applesauce, maple syrup, eggs and sugar in a bowl. 3. Combine flour, baking powder, baking soda and salt in a large bowl. Add wet ingredients to dry and mix until combined. 4. Stir in chocolate chips and pecans if using. 5. Spoon batter into muffin tins. Bake 20 minutes for regular sized muffins, 12 minutes for mini muffins.